Don’t worry,this is not slimy. 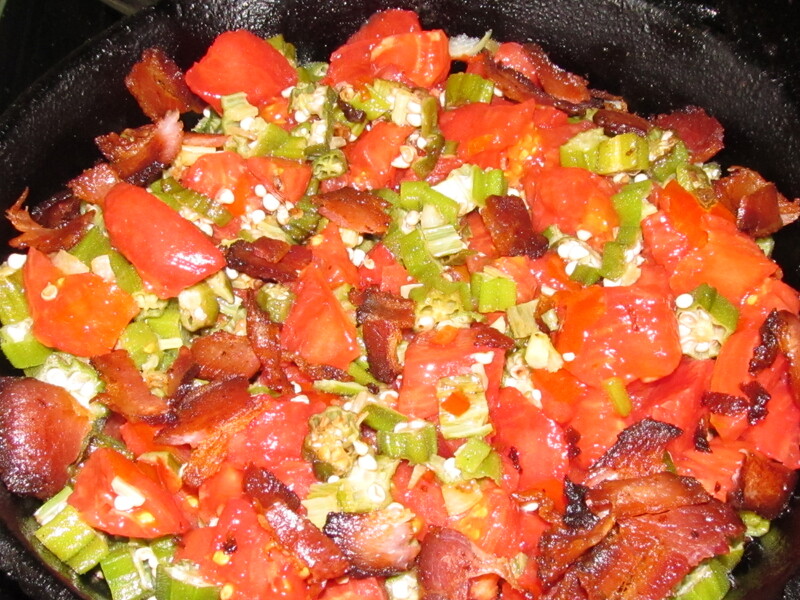 When you add in the tomatoes, the acid breaks down the slime of the okra. I medium skillet fry bacon just until crisp. Remove bacon from grease, to crumble into chunks and reserve for later. Add garlic, jalapeno and sliced okra to grease and fry on medium high heat just until okra is soft and starts to turn brown, stirring so that it cooks evenly. Reduce heat and add tomatoes and salt. Raise heat and let vegetables just come to a simmer. Remove from heat, stir in bacon and serve. Enjoy! Note: You don’t have to peel the tomatoes. I just like mine peeled. I’m so glad you’re going to try it. We combine a lot of our garden vegetables and cook or grill them together. I have several more recipes in my cook book, that you might like. Thanks for trying one of my recipes! I did notice the Recipes, and had a look. But though people are going in so much for Gluten free diets, I am Astonished at the amount of Oil/Fat/Butter in the food. I am trying to get by with about one tea spoon of oil a day in the cooking!